Parrilla gets a solid tourney win, 5th of his WRT career. 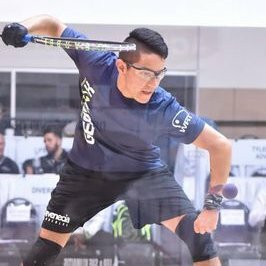 The World Racquetball Tour‘s 2018 Canadian Open is in the books; congrats to Andree Parrilla on his win. Parrilla gets his 5th ever WRT tourney win, and is the third straight different winner in as many WRT events this year. – Tanner Prentice took a close one over fellow Canadian Mitch Brayley 14,11. – Tim Landeryou, who has made the Canadian Nationals finals four times in 8 years, was stretched to a tiebreaker by current Canadian 16U champ Ian Frattinger. – Eduardo Lalo Portillo got a solid win over veteran Canadian Lee Connell. The fireworks started in the round of 16, when 5 of the top 8 seeds were ousted. – #9 Luis Avila topped #8 Justus Benson in a tiebreaker. – #21 seeded Samuel Murray beat #5 seeded Alex Cardona in a tiebreaker. An upset by seed, probably not an upset by overall world standings, and the match did not disappoint. Back and forth action and then a furious rally in the end before Murray got the 11-9 tie-breaker win. Tough draw for Cardona, but good viewing for the neutrals. – #14 Jordy Alonso upset #3 seeded Jaime Martell Neri 8 and 12. Martell has a number of solid wins on his resume, so this isn’t a completely shock result, but Martell is the winner of the most recent WRT event and was a favorite for the semis here. – #22 Coby Iwaasa unsurprisingly upset #6 Christian Longoria 9,6. Iwaasa won a stacked WRT event in Lombard IL in 2014 before heading out on a 2-year sabbatical, and he seems nearly back to his top form. – But the biggest upset happened at the bottom of the draw; Mexican Junior Eduardo Portillo upset #2 seeded Jake Bredenbeck 9,9. Portillo doesn’t have a ton of pro events on his resume, but was a finalist at 2017 18U worlds and in the 2018 Mexican Junior Nationals. A really shocking result for Bredenbeck here, who has 5 career WRT titles including in January. – #1 Bobby David Horn eased past Avila in two straight. – #4 Andree Parrilla took out Murray in two straight. As I noted in the preview, this result should surprise no-one despite Murray’s higher ranking on the IRT. I sense it is just a matter of time before Andree Parrilla is ranked in the 5-6 range on the IRT. – Iwaasa continued his run, dominating Alonso 5,9 to force his way into the semis as the 22nd seeded player in a 24-man draw. – Gerardo Franco Gonzalez took out upset-minded Portillo in a tie-breaker to advance to his 3rd ever WRT semi-finals appearance. – Parrilla evened their career senior h2h record over Horn by advancing in a tactical tie-breaker win. – Iwaasa got his fourth straight 2-game victory over WRT regulars, this time dispatching Franco with ease. In the Final, Parrilla ended up winning 11 and 13, though the scores did not reflect the very streaky nature of the match. Parrilla was down big in game one before rattling off 10 straight to win it, and was up 14-4 before a huge Iwaasa come back. I had predicted a Parrilla win, but definitely did not predict an Iwaasa final. But this is no surprise result for the Canadian, and I hope we get to see more of him going forward. – Top seeded Horn/Benson were trounced in the quarters by the all-Canadian team of Landeryou/Brayley. The other top 4 seeds advanced to the semis. The final was thought to be the expected match-up of Murray/Bredenbeck versus Cardona/Franco … until Murray dropped out and was replaced by Jake’s brother. Cardona and Franco prevailed … I’ll likely make a note of this result in the notes but will transcribe it as if Murray advanced to the final. Either that or I record a fft loss for the losing team. One more event on the books for the WRT this year; the Alamo City Open at the end of November.